The greatest, sweetest obstacle we face is in believing that which we truly are...none other than allness, composed from that which cannot be divided. Our returning, our Re-membering, although never separated, "always already", completes the awesome game of hide and seek God plays with himself through what we call our lives. Each of us is always already... and the illusive trickery we sometimes call death is merely arriving again at where we began. We leave a shell behind, and the divine order in this is bittersweet, our crying, perfectly natural...did not Jesus himself cry? So are we allowed, ecouraged to shed tears over the transition of George Javori...only to the degree we recognize who he truly was and is. Beautiful words for a beautiful young man. Thank you for remembering him. 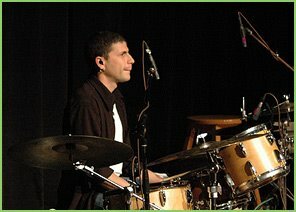 George Javori's lovely choice of "drum sticks" made magic last year with the Joan Baez tour. His eyes continue to weave magic today. Well said. Well said indeed. Thank you to all who were able to attend, contribute and participate in the George Javori Musical Tribute at Sin-e in New York City on March 8, 2006. This unforgettable evening included 4 1/2 hours of over 20 musical acts (plus several pre-recordings of George with friends). for a summary of the performance plus a gallery of photos captured during the March 8th event. Fun Palace Entertainment will maintain an Online Tribute to George Javori at our company site.